Let your daughter know as she gets married how important she is in your life. This wedding gift for daughter has a cut-out photo area to insert a photo either before the wedding or a wedding photo can be inserted after the wedding day. Touching poem for daughter from Mom and/or Dad on left side, cut-out area for a photo on the right side. 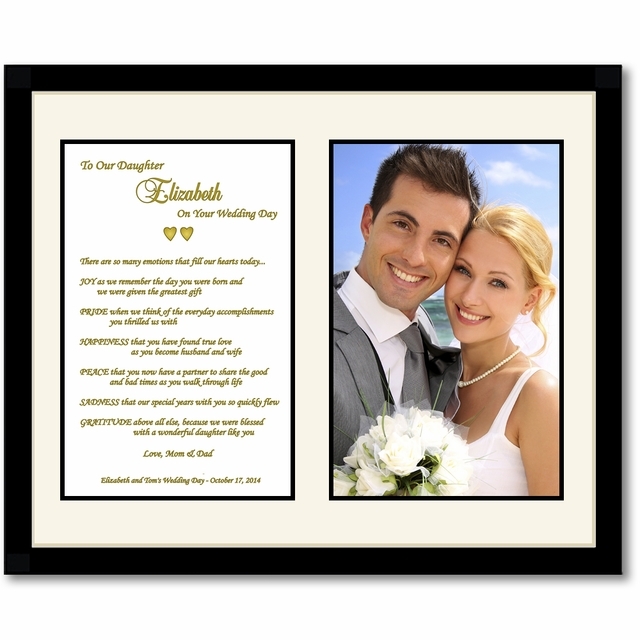 This wedding keepsake will have a prominent place in your daughter and son-in-law's home and will be read over and over again. 3. Closing Phrase & Your Name(s) as seen after poem - Examples: Love, Mom & Dad; With Love, Dad; We Love You, Mom & Kevin; etc. 4. Optional Phrase and Wedding Date as seen after closing - Examples: John and Mary's Wedding Day - June 4th; etc. This is a beautiful framed gift. My husband had no idea I was purchasing this and it made him cry when he read it. Everything I expected it to be.